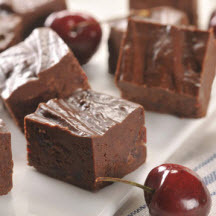 The best tasting, creamiest chocolate cherry fudge you'll ever make. In a heavy saucepan, combine butter, cream and sugar. Bring to a full rolling boil over medium-high heat, Stirring constantly. Reduce heat to medium and continue to boil, stirring frequently, 8 to 10 minutes or until mixture reaches 234°F / approximately 110°C (use a candy thermometer). Remove from heat; add chocolate and marshmallow creme; stir until smooth. Add, almonds, cherries, and extract; mix until well blended. Pour mixture into a 9-inch square pan lined with buttered foil. Chill; cut into 1 1/2-inch squares. Recipe and photograph provided courtesy of Wisconsin Milk Marketing Board, Inc.